Rajasthan PSC conducted 2nd Grade Teacher Exam 2016 for GK Paper on 26.04.2017 & 01.05.2017. Online & Offline Exam for Optional Paper (Subject) was held in June & July 2017. Written test result and cut-off marks (official and expected) can be checked here for GK paper and subject papers. Here has been uploaded result and cut-off marks of the following papers. Note : The result and cut-off marks of the above subjects have been uploaded here as the result is declared by the Commission on the official website. 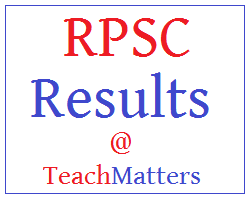 Check here result and cut-off marks of RPSC 2nd Grade Teacher Exam 2011 declared in 2016. Check here RPSC Reshuffled Result of Senior Teacher Grade II (Science, Social Science & Mathematics) exam 2011 declared in 2016. RPSC uploaded the result of Sr. Teacher Grade II for various subjects as per the detail given below. All the qualified candidates are required to download Detailed Application Forms and submit it as per the schedule. Here is the cut-off marks of reshuffled result of Sr. Teacher grade 2 exam 2011 declared in 2016-17. Note : For other subjects cut-off marks, see the concerned subject's reshuffle result whose links are given above. Note : For other information visit official website of RPSC i.e. www.rpsc.rajasthan.gov.in.